this dinner was made possible by OneTable! they invite people in their 20s and 30s to slow down, unplug, join together, and Friday. WHO CAN USE ONETABLE? 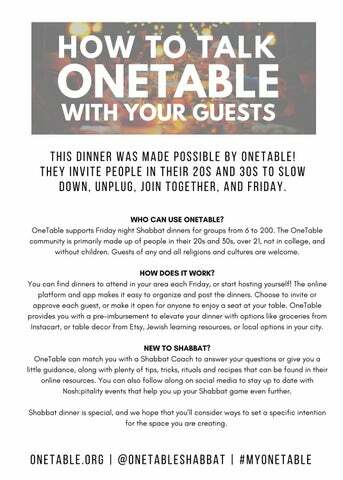 OneTable supports Friday night Shabbat dinners for groups from 6 to 200. The OneTable community is primarily made up of people in their 20s and 30s, over 21, not in college, and without children. Guests of any and all religions and cultures are welcome. HOW DOES IT WORK? You can find dinners to attend in your area each Friday, or start hosting yourself! The online platform and app makes it easy to organize and post the dinners. Choose to invite or approve each guest, or make it open for anyone to enjoy a seat at your table. OneTable provides you with a pre-imbursement to elevate your dinner with options like groceries from Instacart, or table decor from Etsy, Jewish learning resources, or local options in your city. NEW TO SHABBAT? 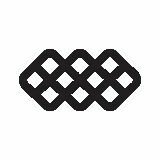 OneTable can match you with a Shabbat Coach to answer your questions or give you a little guidance, along with plenty of tips, tricks, rituals and recipes that can be found in their online resources. You can also follow along on social media to stay up to date with Nosh:pitality events that help you up your Shabbat game even further. Shabbat dinner is special, and we hope that you’ll consider ways to set a specific intention for the space you are creating.